Nov. 8, 2014 — The 2015 One Book One Nebraska selection is Death Zones and Darling Spies: Seven Years of Vietnam War Reporting by Beverly Deepe Keever. The 2015 website with support materials to assist with local reading/discussion activities is forthcoming. Updates and activity listings will be posted on the One Book One Nebraska Facebook group at http://www.facebook.com/onebookonenebraska. 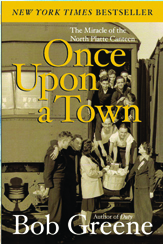 Once Upon a Town: The Miracle of the North Platte Canteen by Bob Greene is Nebraska's reading choice for the 2014 One Book One Nebraska statewide reading program. In this nonfiction story, bestselling author and award-winning journalist Bob Greene goes out in search of "the best America there ever was," and finds it in a small Nebraska town few people pass through today--a town where Greene discovers the echoes of a love story between a country and its sons. During World War II, American soldiers from every city and walk of life rolled through North Platte, NE, on troop trains en route to their ultimate destinations in Europe and the Pacific. This small town, wanting to offer the servicemen warmth and support, transformed its modest railroad depot into the North Platte Canteen. Every day of the year, every day of the war, the Canteen-staffed and funded entirely by local volunteers-was open from five a.m. until the last troop train of the day pulled away after midnight. Once Upon a Town tells the story of how this plains community of only 12,000 people provided welcoming words, friendship, and baskets of food and treats to more than six million GIs by the time the war ended. The One Book One Nebraska reading program, sponsored by the Nebraska Center for the Book, is entering its tenth year. It encourages Nebraskans across the state to read and discuss one book, chosen from books written by Nebraska authors or that have a Nebraska theme or setting. A committee of the Nebraska Center for the Book selected this book from a list of 71 titles nominated by 141 Nebraskans from across the state. The Nebraska Center for the Book board announced the choice for the 2014 One Book One Nebraska at the Celebration of Nebraska Books on October 26, 2013, in Lincoln. Libraries across Nebraska will join other literary and cultural organizations in planning book discussions, activities, and events that will encourage Nebraskans to read and discuss this book. Support materials to assist with local reading/discussion activities will be available after January 1, 2014, at http://onebook.nebraska.gov. Updates and activity listings will be posted on the One Book One Nebraska Facebook group at http://www.facebook.com/onebookonenebraska. One Book One Nebraska is sponsored by Nebraska Center for the Book, Humanities Nebraska, Nebraska Library Association, and Nebraska Library Commission. The Nebraska Center for the Book is housed at and supported by the Nebraska Library Commission and brings together the state's readers, writers, booksellers, librarians, publishers, printers, educators, and scholars to build the community of the book, supporting programs to celebrate and stimulate public interest in books, reading, and the written word. — The finalists for 2015 One Book One Nebraska have been announced. The 2015 One Book choice will be announced at the Celebration of Nebraska Books on Nov. 8. — Check the Events Calendar for happenings near you. 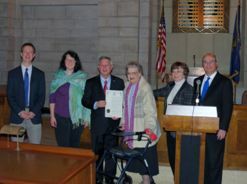 — The Proclamation Ceremony took place place Jan. 16 in the Warner Chamber of the State Capitol in Lincoln. — Planning an event for 2014? Submit the name of the program, location, date and time to be included on the calendar of events.